SALINE COUNTY, Ark. - The sound of a barking dog echoes down terrace drive. A sound that may haunt Bobby Brimer. "I mean it hurts to even think about what I've seen," he said. Monday morning, returning from errands, he turned on a road he's driven up for 30 years, only to witness an horrific attack. "Seen these dogs dragging a woman down the road into the ditch." He jumped out of his truck with his cane and tree trimming tools and tried to beat away the 8 or 9 dogs from the helpless woman. "She was laying in the fetal position and one dog had her by the leg the other by the neck pulling her," he said. He says her injuries are extensive. "Looked like a jugular vein cut right here," he said pointing at his neck. "She had blood squirting out of her." He says the woman was attacked by the dogs outside where they live. He says the owner has been told by neighbors that the animals are aggressive. "For them to be on a little woman like that and tearing her a part, somebody needs to pay," he said. When Saline County deputies arrived, one dog tried to attack an officer and was shot but not killed. Three dogs, including the one that was shot, are now quarantined with Saline County. Deputies are still trying to catch another one in the neighborhood that sits on the porch of the owner's home. "Won't be no more walking up through there without a weapon," Brimer said. The woman's identity has not been released. We were told she was in surgery for the majority of the day but her current status is unknown. SALINE COUNTY, Ark. - A local woman is hospitalized after being attacked by dogs Monday morning. The Saline County Sheriff's Office says it happened shortly before 9:30 a.m. in the 15200 block of Terrace Drive. A deputy was also reported to have been attacked while trying to help the woman and was forced to shoot one of the dogs, which survived. The deputy was not hurt, the woman’s condition is unknown and two dogs (1 MASTIFF AND 1 MIXED BREED) have been confiscated by animal control officers. It's unclear if deputies are searching for any more dogs. 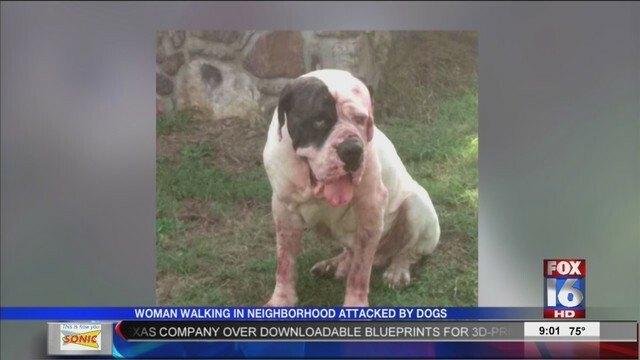 The owner of the dogs witnesses say attacked a woman while walking in her Saline County neighborhood Monday morning has been cited. It's not the first time. According to the Saline County Sheriff's Office, the dog owner was cited for Unlawful Dog Attack, a class 'A' misdemeanor. We're told the owner was cited for the aggressive animals 2 years ago as well. Neighbors say the pack of dogs is also responsible for injuring and killing other local pets. Three of the dogs -- likely involved in Mondays attack -- have been picked up by law enforcement and could be put down.